Your Caribbean cruise nightlife will be rich, entertaining and exciting! Whether you want to relax, party, be entertained, etc., you will find that nightlife onboard a Caribbean cruise heightens your family cruise experience. Caution: Some night activities onboard your Caribbean cruise are meant for adults only. If you are in for some “shaking of the body” or “moving of the limbs”, you will find a disco room available on just about every cruise ship to the Caribbean. Dance until you’re tired. Dance with your partner or someone else’s. Just dance! You are at sea where not many people know you anyway. Have you been to Las Vegas? Do you dream of visiting Broadway? Well, you can have a memorable inclusive family cruise vacation while being entertained – Vegas/Broadway style – on a Caribbean cruise. 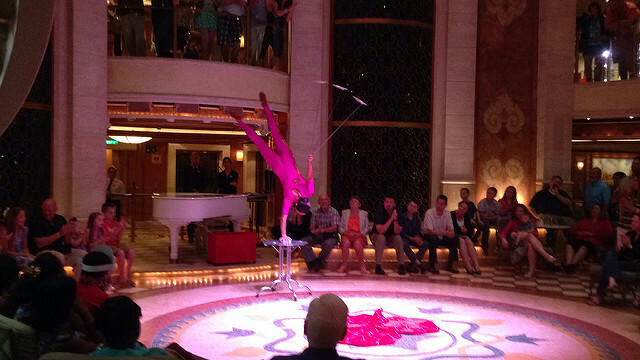 Each cruise ship offers a variety of performances onboard. As a family, we have seen dance performances, singing performances, magicians at work, comedy shows, etc. There are professionally trained entertainers that travel with each Caribbean cruise liner. 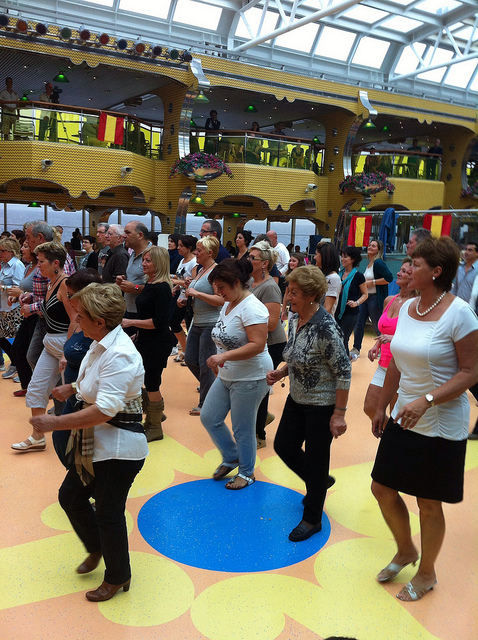 Additionally, your cruise ship will have their own hardworking and well-trained sets of performers. So expect to find a set Carnival Breeze Dancers, Oasis of the Seas Band, etc. The Vegas/Broadway-Style shows on your cruise ship are offered around the dinner schedules. Therefore, early eaters will have a show after dinner, while late eaters will have an opportunity to see a show before dinner each evening. 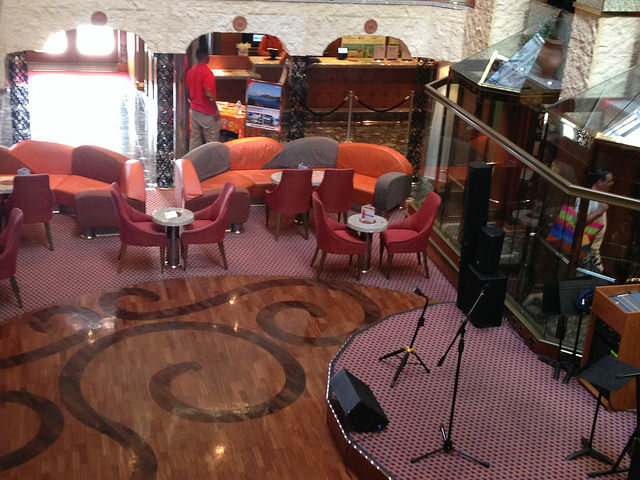 I mentioned earlier that the main lounge – cruise ship’s theater – is the place for various shows, including comedy. Generally, an invited comedian holds a family-friendly comedy show in the main room. However, “adults only” comedy shows are also offered later at night. The kids are not allowed at these shows. By the way, Carnival Cruise Lines now has its own George Lopez Comedy Club on its newest and some upgraded ships. Some people prefer to try their luck at Black Jack or a slot machine. These people have the option of sitting in the cruise ship’s casino anytime they wish – during the day or at night. You generally find a larger crowd in the ship’s casino at night (from personal observation). Caution: You may lose more than you win! While on your Caribbean cruise, you will find a Caribbean band playing somewhere in the pool area – usually on a deck above, overlooking the swimmers. At night, you will find smaller groups of musicians in different spots around the ship. You may find a pianist near Guest Services; a guitarist by a bar; and a small band outside the casino. This all depends on which ship you are on. 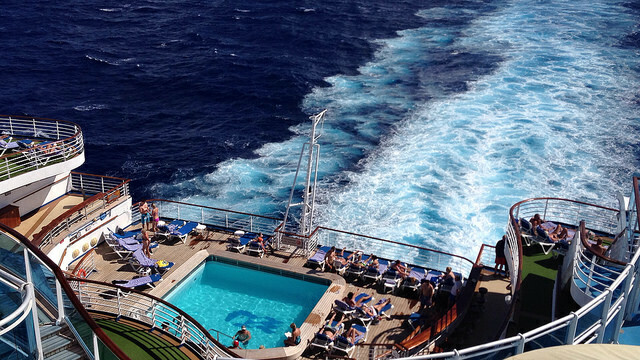 Nonetheless, you will have musicians around the ship, regardless of the cruise liner. You may choose to try a few dance steps with your partner or just relax to beautifully soothing music. Great news on the pools and hot-tubs! They remain open until late. You may wait for the “day crowd” to dissipate and then you and your family may enjoy the pool and hot-tubs at night. The fact is there are fewer people using these amenities after dark. Go for a dip or just soothe away in the hot-tub! 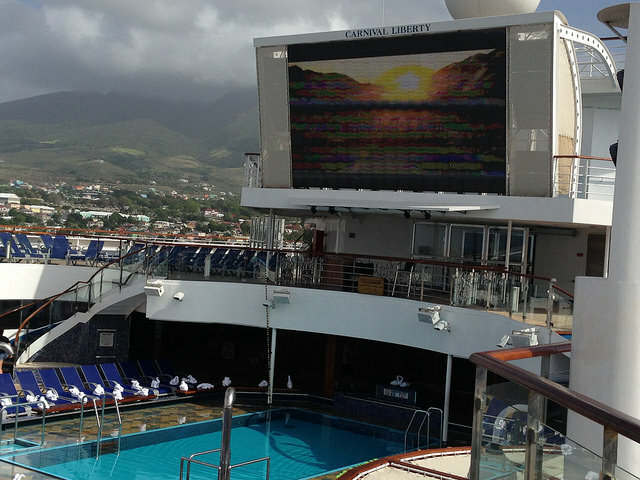 On some cruise liners, you will find a giant movie screen overlooking the main pool area. While you are enjoying the pool or hot-tub, your family may watch an exciting movie. Or you may just choose to watch the movie with your lover, under the Caribbean stars. Where there is not a giant movie screen on the pool deck, there is usually a lounge or small movie room elsewhere. You also have some free movie viewing on your cabin's television and you may purchase others. 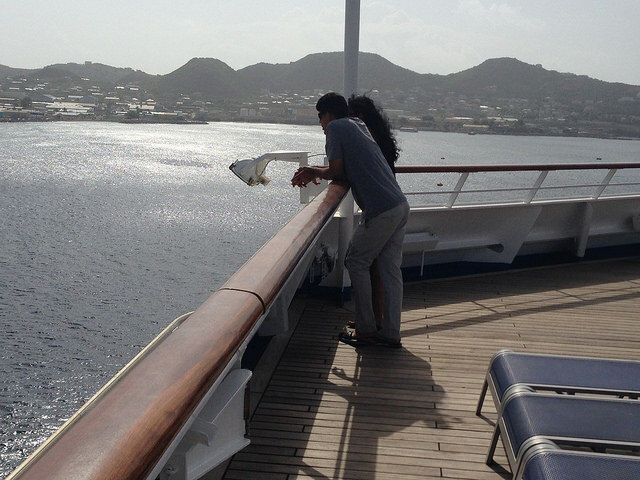 Sneak away to watch a movie, while floating around on the Caribbean Sea. Is there food available at night onboard the cruise ship? Most definitely! If you are splashing about in the water or “getting it on” on the dance floor, you will need to replace those calories. No need to worry about food! 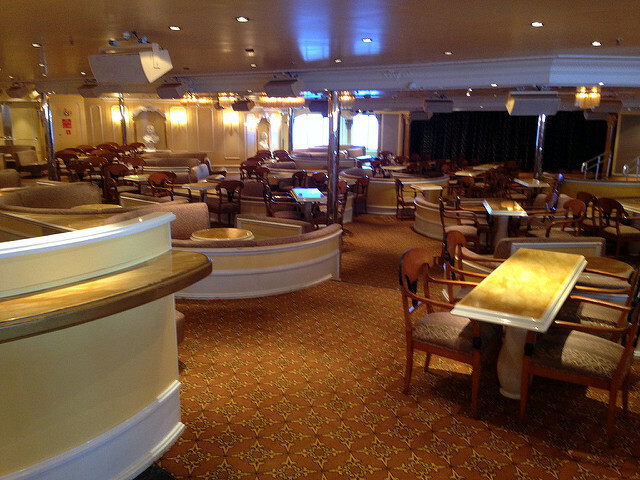 You will find some eateries onboard your ship open until late. Dinner in your ship’s main dining rooms may be served as late as 9:30 p.m.
On some ships, there are also specialty restaurants (these cost additional) such as steakhouses and sushi restaurants, that remain open later than the main dining rooms. Additionally, the pizzeria and ice-cream dispensers are available 24 hours. You will have enough to eat, even at night! You may choose not to get involved in any nighttime activity onboard ship. After all you are on vacation to unwind. Spend time with your family and that special person in your life. After living it up during the day, you two may choose to find a quiet spot on an open deck, hold each other’s hands, hug each other’s neck, just count the stars and catch up on life. What a great way to spend an evening on the Caribbean Sea! What Happens To The Children At Night On Cruise Ship? Yes, I have been talking mostly about what you, the grownups, can do at night, but have said little about the children. While only some night activities onboard ship are kid-friendly, you do not need to worry about the children if you want to go off and have some fun. The professionally trained counselors who entertain and engage your kids in activities during the day, do the same until about 10 p.m. at night (this varies by cruise line). There is also a paid childcare service after hours. So if you must hang out with that special someone really late, you may agree to have the counselors babysit for a fee. Older kids have other activities to do at night. These include discos and game rooms. I have given you many options from which to choose, while onboard ship at night. Whatever you choose to do, I am quite certain that you and yours will have a rich and exciting Caribbean cruise nightlife.